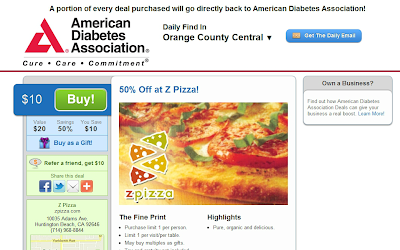 Weighty Matters: American Diabetes Association selling ice-cream and pizza for the cure?! American Diabetes Association selling ice-cream and pizza for the cure?! Hot off the heels of yesterday's obscene public-private partnership between Pizza Pizza and Canadian children's hospitals comes these equally offensive and insane partnerships with the American Diabetes Association. Forwarded to me by Dr. Jacqueline Jacques of Bariatric Advantage, they're called, "American Diabetes Association Deals". 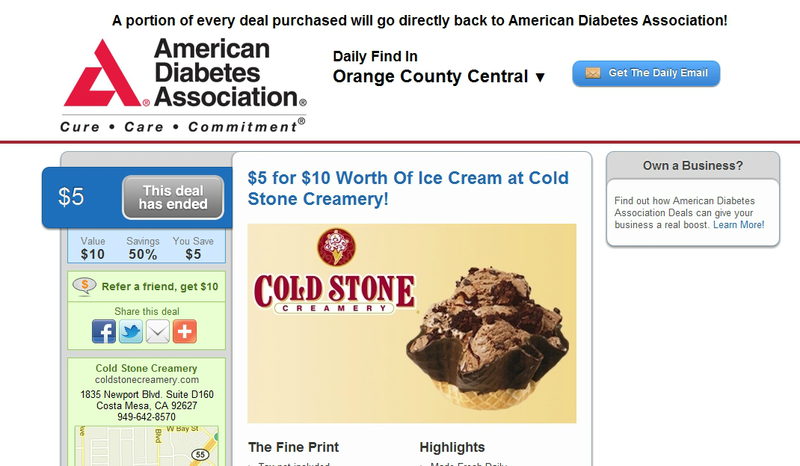 "A portion of every deal purchased will go directly back to American Diabetes Association!" So what sort of deals have they featured recently? "$5 for $10 Worth Of Ice Cream at Cold Stone Creamery!" "50% Off Create Yo'-Own-Gurt Purchase!" "$10 Worth Of Juice It Up For $5"
I'm so jaded at this point, none of these types of co-branded sales/fundraising ventures shock me anymore, but what I still can't wrap my head around is how they don't shock, offend, shame, and horrify the folks who actually work over at the American Diabetes Association? If I were king, heads would roll. Given I'm not, I guess I'll just publish this post. V-neck t-shirts - Yay or nay? How does the guy know who did it? Domino's thinks 2oz of pizza is a serving! ?